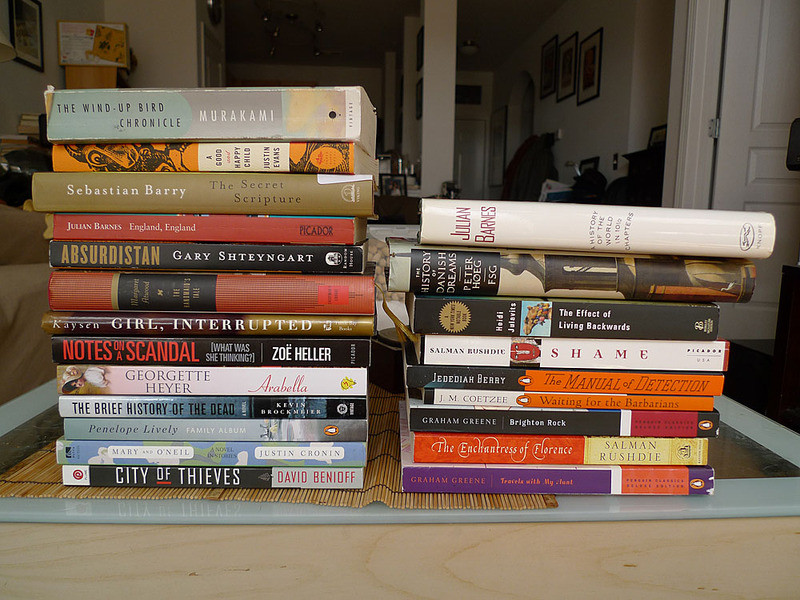 I once had a friend tell me that I probably got as much enjoyment out of making lists of books I wanted to read as I did actually reading said books. What can I say? I'm a list maker and love to plan! Like many other book bloggers, I'm always on the lookout for my next great read, and while other blogs are great resources, sometimes I feel like the same books pop up in my Google Reader again and again. That's one of the reasons I love bookstores: I love browsing around and just randomly picking up books and finding titles I've never heard of before. Of course, I'm not immune to the great prices that online shopping can provide, but personally I find book browsing on Amazon (and the like) to be a little tedious and it seems a lot harder to discover surprises that way. Enter YourNextRead. While this isn't the first site I've stumbled across that purports to help readers find their next book, this is one of the best and most effective interfaces I've found. The premise is pretty simple: you type in the name of a book or author that you like, and a little web of related books pops up. Click on one of those, and new titles appear that are related to that second title. Lather, rinse, repeat. What I particularly like about this process is that it kind of operates on the whole "six degrees of kevin bacon" principle. As you click through interesting book options, it's a bit like choose your own adventure, but the books are ultimately linked in some way to that first book you picked. I do like that you can influence the direction of subsequent title suggestions as it's just so much more interactive than a simple list. Additionally, for each title that pops up that is linked to the central book, you can indicate whether you think people who enjoyed the central book will actually enjoy each linked book. I assume that these votes then influence the likelihood of that book showing up again when someone else chooses the central book in the future. One problem I have with Amazon recommendation systems (and many other book recommendation programs) is that they seem to rely too heavily on suggesting other books by the same author. Of course it stands to reason that if I enjoy Pride & Prejudice by Jane Austen that I might very well like her other books, but I could probably have figured that out on my own! 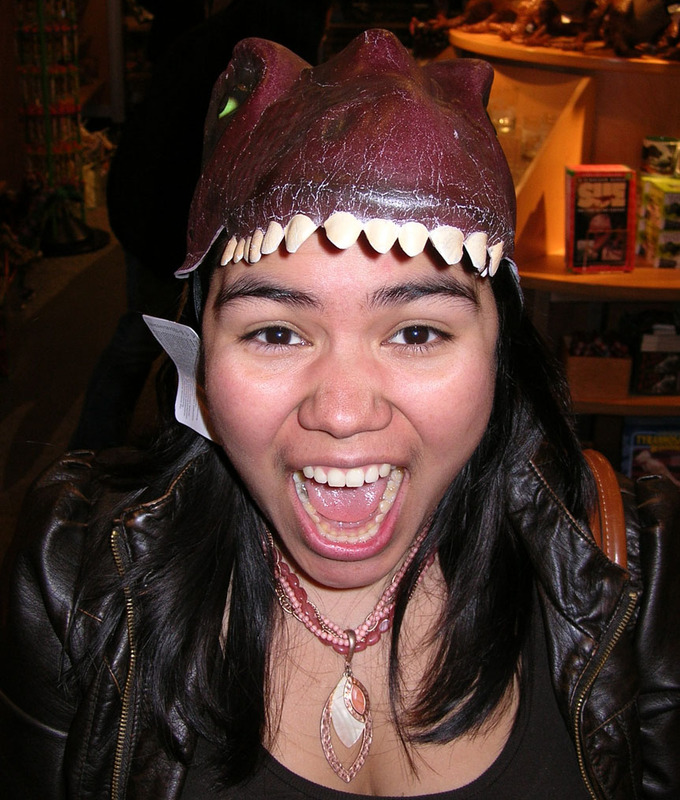 I am always looking for new authors, and I've found that YourNextRead does this very well. For instance, on a recent search, I put in Then We Came to the End by Joshua Ferris as my starting novel. From there, I jumped to A Life Apart by Neel Mukherjee (never heard of him!) which looks good enough to warrant further investigation. From there I jumped to A Visit From the Goon Squad by Jennifer Egan (a book I have and intend to read in the future), where I then jumped to The Summer of Naked Swim Parties by Jessica Anya Blau (another new-to-me author). That one didn't seem like my cup of tea, so I backtracked to Goon Squad, and instead tried Come, Thou Tortoise by Jessica Grant (??? exactly! ), which seems delightful. 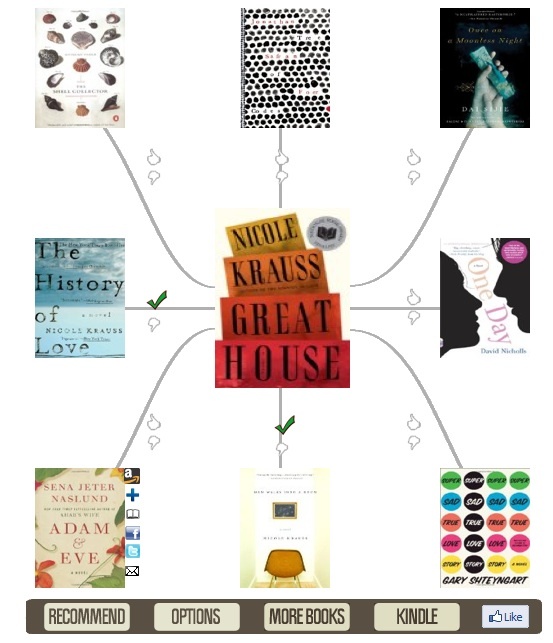 From there it's onto The Irresistible Henry House by Lisa Grunwald which sounds effing awesome. And again, is completely new to me. I'm starting to feel a bit like Thursday Next with all this book jumping, plus I think you get the picture. Along the way, I had seven different alternatives to check out each time (plus there's the option to refresh if a central book isn't presenting anything you think looks appealing), but just from this little experimental jaunt, I've found three new books that are now on my wishlist. Dangerous for those of us with bookbuying impulse control, but a really fun way to explore the book universe. If you feel like you're stuck with the same old stuff in your reading pile, this may be just the way to liven things up! Try it out; it's wildly addictive! And feel free to share in the comments any of the book chains you create! 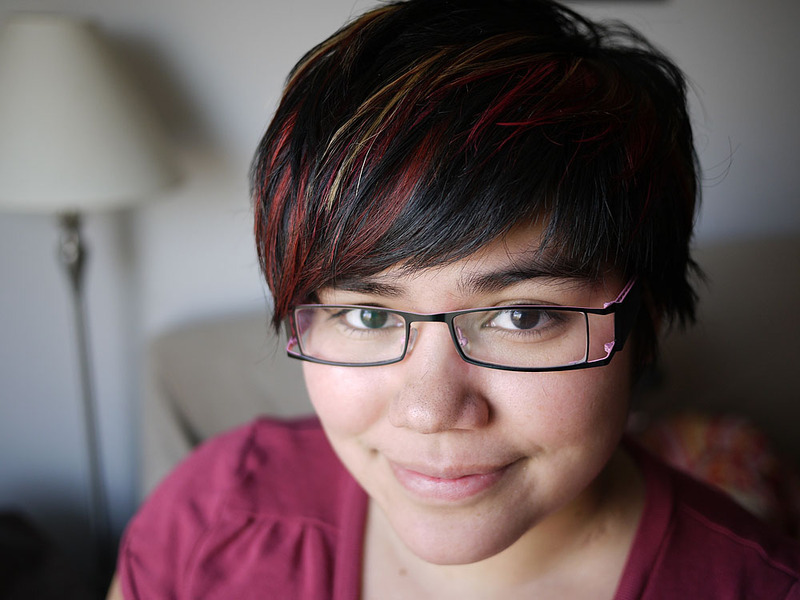 I apologize that of late it feels like I write more reviews on others sites than I do here, but you know the drill by now: new month, new BookPage, new reviews by Steph and Tony! 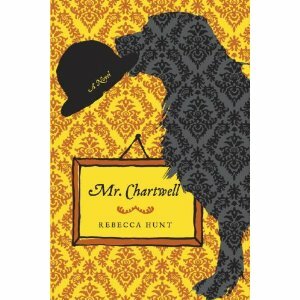 This month I covered Rebecca Hunt's debut novel, Mr. Chartwell. You might not normally expect the words "chronic depression" and "quirky" to go hand-in-hand, but they merrily skip about in this novel. Taking inspiration from the fact that Sir Winston Churchill used to refer to his battle with depression as his "black dog", Hunt takes the metaphor and makes it real in the form of beastly Mr. Chartwell, a hulking black lab. While Winston Churchill obviously plays a role in the book, to me the most intriguing character was entirely of Hunt's own creation, Esther Hammerhans who has troubles of her own. 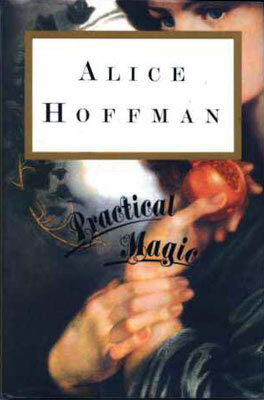 This was a quiet yet spirited novel that I found very thoughtful and probing. If you'd like to read more about it, you can read my full review here. 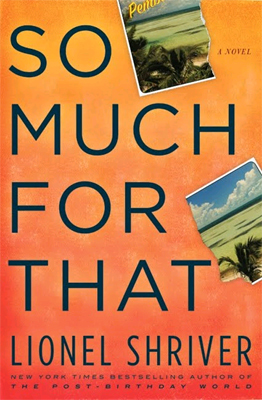 Tony tackled a much larger book than I this month (ain't that always the case? 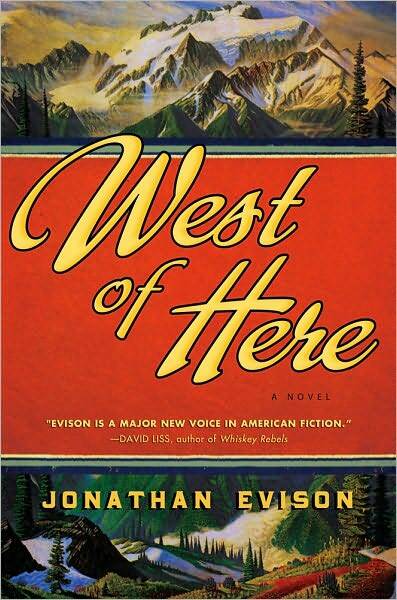 ), and reviewed Jonathan Evison's latest novel, West of Here. The book has already been getting a lot of buzz and BookPage actually chose it as their top pick of the month! If you're into sweeping epics that span multiple periods of time, then this is the book for you. It features a small town in the Pacific Northwest and looks at the building of a damn back in the 1800s and how it is pivotal to sustaining life in that region... only for the damn to become a burden in the modern age. A intelligent look at the way the country and our lives have changed, this is a book you'll not want to miss. You should also not miss Tony's review, which you can check out here!